The Hunter's main weapon is the bow, and thus they favour ranged combat. While they can handle close range with a short sword and shield, it's very vulnerable to magic. This class fights relying on enemy's weaknesses, without having a proper combat style. Its light armor, made of soft leather, gives enough protection and mobility. Common hunters are inevitably connected to forests, where they await their prey. In Dark Souls, the Hunters are evidently connected to Darkroot Garden. Those forests are a perfect place for hunters, even more so if they are members of the Forest Hunters covenant. A Hunter's equipment is found on a corpse at the path leading to Darkroot Basin, apparently deceased by falling off the ledge. Pharis was also a Hunter. His hat describes him as a great human archer, even compared to Hawkeye Gough. Broad-brimmed hat favored by the archer hero Pharis. 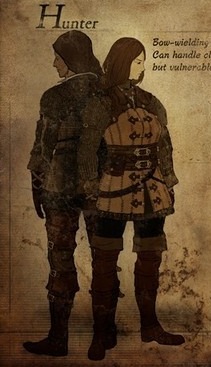 Pharis was an accomplished archer, and though he was human, he ranked alongside Hawkeye Gough, one of the Four Knights of Lord Gwyn. His hat is universally popular among children.